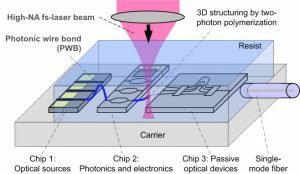 Are you looking for flexible photonic system concepts that can address strongly heterogeneous markets based on a uniform technology? 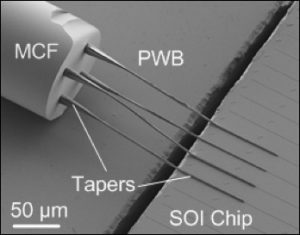 Industrial sensors must be reliable and robust – strong arguments for photonic integration. Do not let optical assembly and packaging challenges spoil the dream! 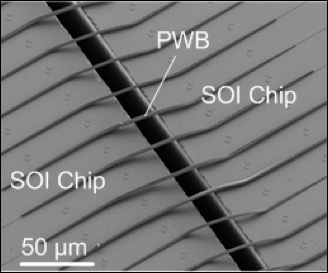 Vanguard’s proprietary photonic wire bonding technology enables highly stable chip-scale photonic modules that can be fabricated at low cost. We are happy to try this out with you. Let’s face it: There is simply no perfect integration platform for photonic systems! Instead, designers have to deal with a variety of material systems – silicon photonics, indium phosphide, TriPleX™, just to name a few. Vanguard’s proprietary photonic wirebonding technology can merge the distinct advantages of these platforms by connecting single-mode photonic circuits across waveguide boundaries – without active alignment, and without additional elements for mode field adaptation.